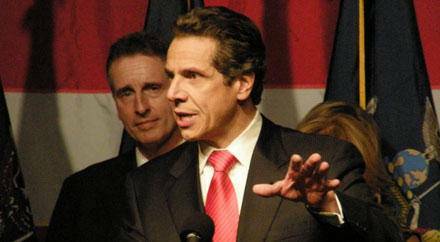 Governor Cuomo is proposing early voting in New York as part of his State of the State message, due out January 3rd. But a top aide to the governor says it might be awhile before the proposals could become law and take effect. The proposal would require each county to set up at least one early voting poll site during the 12 days leading up to Election Day. The sites would be open for five hours a day on the two weekends leading up to elections, as well as eight hours a day on weekdays. Cuomo’s counsel, Alphonso David, says New York is behind other states, and he’d like to see that change. The governor would also like to institute automatic voter registration. Right now it is offered through the Department of Motor Vehicles and other agencies, but potential voters need to fill out additional lines on the forms. Under the proposal, the agencies would simply send the voter’s information to the relevant county board of elections, unless the person does not wish to be registered to vote and checks an opt-out box. And Cuomo says he’ll introduce a plan for same-day voter registration. David says online voting is not being considered at this time because there are too many worries about cybersecurity. But he says the administration would be “open” to creating a system of mail-in voting. The Democratic-led State Assembly has embraced similar measures in the past, but they have stalled in the State Senate, which is ruled by a coalition of Republicans and independent Democrats. David concedes the voter expansion measures might not get approved in 2018. “Sometimes it takes more than one year to advance a legislative proposal,” said David, who said the push to legalize gay marriage and raise the age of adult incarceration for youthful offenders also took several years. Government reform groups are encouraged by the proposals. “The early voting just modernizes voting to be in the same sort of system as the rest of society,” said Blair Horner, with New York Public Interest Research Group. He says the measures would go a long way to remedy that. Common Cause has long advocated for early voting. It’s executive director, Susan Lerner, says she’s “pleased” with the proposals. But she disagrees though that it may take years to implement early voting in New York. She thinks there’s momentum to do it in 2018. “I think there is an engagement and an expectation on the part of New York voters that our election laws are going to catch up with the rest of the country this year,” Lerner said. The governor has also proposed a package of reforms to help county boards of elections better protect against cyber attacks and to more closely regulate political ads on social media, in the wake of reports of Russian infiltration of Facebook and Twitter during the 2016 elections. It would also aide counties in Horner, with NYPIRG, says it’s more likely that the governor will find bipartisan support in the legislature to make those changes.